"News E-Paper" sounds a bit cumbersome; why not just call them mediatrons? That has a nice futuristic sound to it. After all, if science fiction author Neal Stephenson wrote about them in 1995 in his novel The Diamond Age, shouldn't we give credit where it is due? Bud took a seat and skimmed a mediatron from the coffee table; it looked exactly like a dirty, wrinkled, blank sheet of paper. "'Annals of Self-Protection,'" he said, loud enough for everyone else in the place to hear him. The logo of his favorite meedfeed coalesced on the page. Mediaglyphics, mostly the cool animated ones, arranged themselves in a grid. Bud scanned through them until he found the one that denoted a comparison of a bunch of different stuff, and snapped at it with his fingernail. The first out of the gate, Belgium's De Tijd, another finance journal, uses the iLiad E-reader, developed by iRex Technologies, a spinoff of Royal Philips electronics. The daily economic paper Les Echos is now testing France's first papier électronique?. The device used is not flexible; it's more like a lightweight (less than a pound) tablet display. 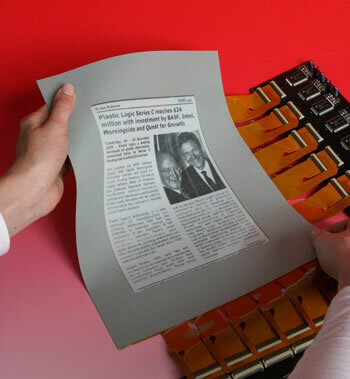 The flexible displays are black and white only, with 16 shades of gray. Advertisers are interested, despite the lack of color. These devices can have some programming along with the content; they can show coffee ads in the morning and beer ads in the evening, for example. Also, if the reader is standing in a WiFi hotspot, you could access more information from an ad, thereby combining the best of the web with the convenience of newspapers. For other display-related news, see Node Explorer - Part Hitchhiker's Guide, Part Marauder's Map and Sony Reader Electronic Paper Book. There was a nice article on this in the New York Times this morning; unfortunately, you'll need to pay to read it. Try looking here and here for online sources.